Tamarind (Tamarindus indica) (from Arabic romanized tamar hindi, “Indian date”) is a leguminous tree in the family Fabaceae indigenous to tropical Africa. The genus Tamarindus is a monotypic taxon, having only a single species. 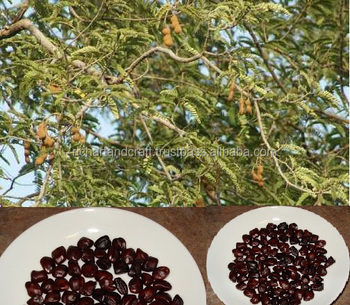 The tamarind tree produces edible, pod-like fruit which are used extensively in cuisines around the world. Other uses include traditional medicines and metal polishes. The wood can be used in carpentry. Because of the tamarind’s many uses, cultivation has spread around the world in tropical and subtropical zones. The tamarind is a long-lived, medium-growth, bushy tree, which attains a maximum crown height of 12 to 18 metres (40 to 60 feet). The crown has an irregular, vase-shaped outline of dense foliage. The tree grows well in full sun in clay, loam, sandy, and acidic soil types, with a high drought and aerosol salt (wind-borne salt as found in coastal areas) resistance. Throughout Southeast Asia, fruit of the tamarind is used a poultice applied to foreheads of fever sufferers. Based on human study, tamarind intake may delay the progression of skeletal fluorosis by enhancing excretion of fluoride. However, additional research is needed to confirm these results. Tamarind wood is a bold red color. Due to its density and durability, tamarind heartwood can be used in making furniture and wood flooring.